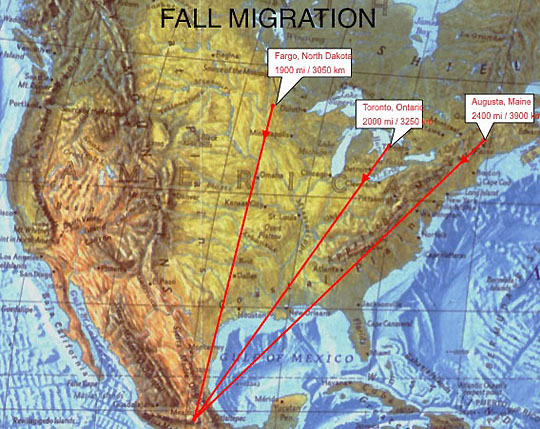 - Lincoln Brower, Ph.D., Biologist, Sweet Briar College, VA.
Fall Migration map showing the 1900 to 2400 miles that Monarch butterflies travel each fall from American regions to central Mexico's Oyamel fir forest for the winter. Then in the spring there is a second shorter migration from southern U.S. Graphic © Prof. Lincoln Brower, Sweet Friar College, Virginia. November 22, 2013 Sweet Briar, Virginia - Monarch butterflies (Danaus plexippus) living east of the Rocky Mountains in North America have flown south each fall, gathering in central Mexico's Oyamel fir forest to get through winter. This extraordinary Monarch migration is unique in the insect world. None but the Monarchs in different generations fly twice every year in fall and spring for as much as 2400 miles each way. Their destination are twelve mountaintops west of Mexico City covered with Oyamel firs. Historically when the Monarchs were healthy and not threatened by radical changes in their milkweed food and a warming climate, a billion of the beautiful orange and black creatures would fly south and literally cover some 60 acres of the fir trees.